See details Keratex 3P Hoof Repair for horses 50ml. Keratex 3P Hoof Repair for horses is an easy to use hoof repair and filler. Keratex Feed Supplement for Hooves improves both horn quality and growth. Skin and hair will also improve. Keratex Frog Power Cleanser for horses is a powerful formulation which keeps heels and frogs healthy. Keratex Hoof Gel for horses is an all year round hoof dressing which protects the whole hoof capsule against the effects of water and urine. 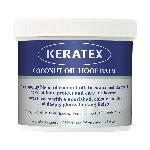 Keratex Hoof Hardener for horses strengthens horn within the first hours of application. Keratex Hoof Moisturiser for horses is a moisturiser and conditioner capable of controlling the moisture content in hooves during dry weather. Keratex Hoof Putty for horses is an easily applied filler for cavities. Keratex Hoof Shield for horses is the horses "nail-varnish"
Keratex Hoof Wash for horses is a disinfecting hoof and fetlock soak. Helps to protect the horse against a whole range of common ailments.